When shopping for a glass water bottle it can get very overwhelming pretty quickly. There are literally thousands of options to choose from when it comes to glass water bottles. It can be difficult to decide what is important, and what doesn’t matter for your situation. Based on thousands of online reviews, the best glass water bottle is the ZULU Atlas. This is THE perfect water bottle! Odor free, stain free, PVC free, dishwasher friendly and very affordable with lots of great colors to choose from. The Flip Lid makes this glass water bottle a great choice for any occasion. It can be tempting to just get the cheapest one and be done with it. We decided to check out 10 of the best glass water bottles available and really see what the differences are, and why they matter. Hopefully this will give you a better place to start when you are choosing what is best for you. We started with the best glass water bottles based on reviews and features. To start with thousands and narrow it down to ten to begin with was not an easy task. The hope is that these particular ten glass water bottles have a range of features and significant enough differences to make it possible for you to see what is best for you. Whether you take your glass water bottle with you to the gym, to the office, riding a bike or into the car it is important you get the right one. There are details like some are easy to put ice into and others are pretty much impossible. That can make a significant difference in how great or how frustrating it can be to use yours. The different types of glass, and why it is important to know what yours is made of. The different types have advantages and disadvantages. Glass is not just glass. The width of the mouth of the water bottle is significant for its use. Both in terms if putting things in and getting things out, you will want to know and choose the mouth of the bottle appropriately. The features of the lid are varied as well. Hopefully they all report to be leak proof, but we will check that, too. Flip tops and bite valves and straws are all important to decide about. The sizes available are critical, too. If it won’t fit into your cup holder in the car, or doesn’t hold enough water for enough time, it doesn’t matter how functional it is otherwise. We will look at other features such as carry straps, and measuring tools and just how pretty each one is. A serious black water bottle is sometimes best, but sometimes a splash of pink can make it easier to decide to keep it nearby. We will also examine the reviews and see if there is anything in terms of a pattern that suggests a particular use, something to watch out for, or anything else interesting or extraordinary. Let’s get to looking at glass water bottles and how they compare. This Zula Atlas Glass water bottle is designed for athletes of all types. It is especially marketed for those who are involved in activities so intense that they prefer not to stop in order to have their drink of water. Glass Type – This glass water bottle is made from a soda lime glass. It is certified to be lead free, phthalates free, PVC free and BPA free. It is designed specifically to not retain odors, stains or bleach in the sun or with repeated cleanings. This water bottle will preserve the temperature and the taste of whatever beverage you are carrying with you. Wide or Narrow Mouth – This glass water bottle has a unique reinforced wide mouthed push button top that is designed to be operated with only one hand. This makes it easier for athletes to take in water quickly and not have to stop their activity. The lid stays nicely out of the way while you drink so it does not slam into your face while you are drinking. Features of the Lid – The lid is completely leak proof, unless it has been put onto the bottle incorrectly, as with most any water bottle. It can be carried in a back back, even without assurances it will be held up vertically, and still not leak. The Flip Top operates with just one hand, quite handily. Sizes – This is a 20 ounce glass water bottle that measures 3 1/2 x 3 1/2 x 10.3 inches. It weighs just 1. 26 pounds. It is a bit too big to fit into some of the much older car model cup holders that are of the dash board flip down type. It is a normal standard size and does fit nicely into the current model car cup holders that are more typically in the console area between the driver’s and passenger’s seats. Other Features – This glass water bottle has a protective silicone sleeve that is available in a wide variety of colors. It provides maximum protection from impact and is dishwasher safe. The variety of colors, and the design of the silicone sleeve makes this water bottle one that could suit most everyone. This is a really attractive glass water bottle and it comes in such a wide variety of colors that it would be a good general choice for any person. The one handed operation makes it especially good for runners or others who are looking to drink water and not stop their activity. Bkr is pronounced “beaker”. Bkr is marketed as a glamorous approach to drinking more water. Owners of bkrs drink 2-10x more water they say. The creators of bkr believe that everything you own should be something you love. They have therefore created the Bkr to be something you can love. Words like “elegant” are used to describe a Bkr. Not a typical word for glass water bottles. Glass Type – Bkrs are marketed as an “antidote to cheap, disposable plastic bottles”. Glass being chemically inert is better for the earth and for your body. As you know from drinking from glasses at home, glass doesn’t change the taste of what you are drinking and won’t allow unsafe chemicals to leach out of it, making you sick. Be careful not to drop it more than 3 feet, it might break. The glass itself is like an average beer bottle in thickness, perhaps a bit thicker. Narrow Mouth – The Bkr glass water bottles feature their signature small mouth bottles. The mouth is about the same size as the mouth of a disposable plastic bottle. A small mouth means no big ice chunks but the company does sell ice cube trays for making small ice cubes to fit in the mouth of the bottle, if you need ice. This is not the right bottle for you if you put tea bags or pieces of lemon into your water bottle. There is no trouble getting this bottle filled from water coolers, faucets or water fountains but it is not as easy to fill as a bottle with a wider mouth. It is nice to drink out of. Lid – It is important to be careful about putting the lid on this water bottle. Make sure it has been screwed on properly or it may leak. The silicone seal in the cap keeps the water inside the bottle, even upside down, but you have to be sure it is sealed properly. Sizes – The Bkr is 7.88 inches tall and 3.18 inches wide. It holds 16 ounces. That makes it an ideal size for carrying with you. There are many water bottles that hold more water, but this is a lovely size for carrying on shorter outings or if you know you will have a chance to refill. Other Features – The Bkr’s silicone sleeves is perfectly grippy. It will protect the glass from breakage while insulating what’s inside. It is safe to wash it in the dishwasher on the top rack. The silicone was chosen because it is recyclable. The sleeve is also safe in the dishwasher so you do not need to remove it, but it is easy enough to slip it off if you wanted. It is recommended that you store your bkr with its cap off. The Bkr glass bottles are minimal and beautiful. The designs have been inspired by everything from fine art to fashion, photography to contemporary culture. The bottles are classy and beautiful, and marketed to A-listers everywhere. Bkr has a dedicated following within the fashion industry, among celebrities, and beauty editors. 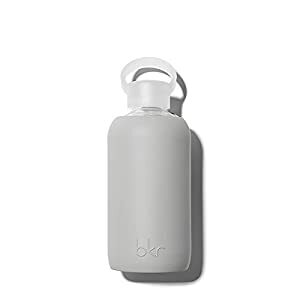 Bkr is a cult favorite and a symbol of pure mindful chic around the world. This is a super glamorous approach to water bottle requirements. For those with a penchant for beautiful things, this is an ideal accessory for the every day need to get your 8 glasses in. This Purifyyou Premium Glass water bottle comes in a array of terrific colors, and in singles or multi packs. It is functional and attractive, looking much like a nice family water bottle choice. Glass Type – The glass is high borosilicate glass. It is specifially more heat resistant than other types of glass that are commonly used for water bottles. This is the type of glass you want if you are going to be using your glass water bottle for hot beverages. The glass is 100% recyclable and of course does not leach unwanted flavors nor harmful chemicals into the beverage like plastic or metal can. BPA free, lead free, PVC free, Phthalate free, cadmium free and reusable with a high-impact-resistant food-grade silicone sleeve. Wide Mouth – It has an easy twist-off cap for quick access. With the wide mouth it fits fruit and ice, but is sufficiently narrow so you can drink without spilling. Features of the lid – This glass water bottle is absolutely leak-proof. It is kid proof, as well. The lid features a unique stainless steel inside cap so that water never touches any plastic. The cap is polypropylene plastic, which resists chemical leaching and corrosion. This is the kind of plastic that is used commonly in kitchen storage products like Tupperware. Sizes – The Purifyou glass water bottle is both portable and stylish. It is lighter and thinner than an average water bottle so it is great for carrying with you everywhere. The 12 or 22 oz bottles will even fit into your purse. You can get them small enough to fit into the tiny lunch boxes the kids love. They do actually fit into those pesky cup holders in the car, but all vehicles are not ever guaranteed. Other Features – The impact- resistant sleeve is made of silicone. There is a non- slip grip which makes it much less likely it gets dropped in the first place. The cap has a large O- ring to enable you to carry it more easily. The silicone sleeve is of course an excellent insulator. Your beverage is kept hot or cold for extended periods. Dishwasher and Microwave safe. This glass water bottle has a satisfaction guarantee. The customer service department is local, here in the USA, with more than 15 years of experience. The Kablo Glass Water bottle is specifically marketed to those who care about our environment. Glass Type – The 100% high-density borosilicate glass contains no contaminants. It is phthalate-free, BPS-free, BPA-free, non-toxic, and contains no lead. Uncontaminated organic materials are used in the production of these high quality borosilicate glass bottles. These glass bottles are gentle on the environment but they are sturdy enough for your every day use. In fact, you can even pour boiling water into them. Wide Mouth – These Kablo Glass water bottles have wide mouth 2-inch openings for lots of room to add your ice, or to create fruit and herb infusions. Features of the lid – The lids on the Kablo Glass Water Bottles are completely leak proof and air tight. The outside of the cap is made of stainless steel. The inside of the cap is BPA- free polypropylene (pp #5). This type of polypropylene does not contain ‘Bisphenol A’ (BPA), which is the leaching chemical that is linked to several different diseases. Polypropylene lasts longer and resists wear better than other kinds of plastic. The cap has a 100% silicone liner which is easy to remove for cleaning. This lining prevents leaks. Sizes – These glass water bottles come in 21 ounce or 32 ounce sizes. Just refill once or twice to provide the total daily water intake. They do fit into cup holders as long as they are standard sized. Other Features – These Kablo Glass Water bottles are resistant to thermal shock. They are made of a particularly shatterproof glass making this water bottle a safe alternative. In the event of glass breakage, the bottle would split into a few large pieces. The bottles are dishwasher safe. The stainless steel caps are better washed by hand. These glass water bottles are sold without protective silicone sleeves, but they are available to purchase and are sold separately. Kablo is so confident that the glass water bottles will not break that they offer a 1 year, one time, free replacement guarantee. If your glass water bottle gets broken in the first year after you purchase it, they will ship you a replacement. They even cover the shipping costs. Kablo is all about the environment. As such, annually they donate 1% of their proceeds to charities that support environmental causes. They donate to charities like: the World Wildlife Federation, Ocean Conservancy, Greenpeace International and the Environmental Defense Fund. Camelbak also has their “Got your Bak guarantee”. They say, “if we build it, we’ll Bak it with our lifetime guarantee”. Sounds like a pretty good guarantee, especially for something made of glass. Glass Type – The Camelbak Eddy Glass water bottle is a beautifully styled bottle made from naturally BPA-Free and lead-free glass. It will not retain taste or odor. You will always get clean, clear hydration that is good to go! Features of the lid – The unique spill proof lid allows sipping without tipping the bottle using the patented flip-top bite valve system. All you do is flip open the bite valve and you can sip. Flip, Bite and Sip. There is no tipping of the bottle required, but you can if you want just by removing the straw. The newly redesigned bite valve and cap provide a faster flow and newly enhanced durability. Sizes – This is a small water bottle. It holds just 0.7 litres, or just less than 3 cups. It is lovely for a short event like a yoga class or when you are going somewhere you know you can easily refill. The dimensions are 10 inches x 1.4 inches x 3.5 inches. Other Features – This Camelbak Eddy Glass water bottle has a lovely and stylish silicone sleeve that is easy to grip. It adds a lot of extra protection for any potential impact. Overall this is a durable water bottle that is easy to carry. It is entirely spill – proof as well. Every bit of it is top – rack dishwasher safe. Available in a large selection of really great colors so there is bound to be one for every taste. The innovative design of the Ello Syndicate will meet all your hydration needs. You will want to carry this super duper cute bottle everywhere! Glass Type – The Ello Syndicate Glass Water Bottle is cadmium free, lead free, PVC free, phthalates free and BPA free. It is made of delightfully clean – tasting glass. These Ello Syndicate Glass water bottles do not smell or stain, or have that metallic or plastic – like taste. Do your part to save the planet. Wide Mouth – Ice cubes will fit easily into the wide mouth of this glass water bottle. It has been specifically designed to provide you with the perfect sip, drip – free whenever and wherever you need it. Features of the lid – This glass water bottle has a unique one – handed push button type lid. There is a convenient carry loop that is attached so you can bring the bottle with you wherever you may be going. With a flip lid using the one – handed operation you will never have to stop to drink. It is really ideal when you want to grab a quick little sip but not interrupt your momentum, let go of the steering wheel, your shopping bags, or anything else you might be carrying. Sizes – The Ello Syndicate 20 ounce glass water bottle is 2.8 inches x 2.8 inches x 10.8 inches. It should fit in any standard cup holder. Other Features – This bottle has a regular type of protective silicone sleeve, but it has an extra thick base that makes it even more non slip. The sleeve has cut outs in it so you can always see just how much water you have left. The carry loop is great for car trips and for taking the bottle to the gym. Every bit of it is dishwasher safe, but never use it in the microwave or freeze the bottle itself. Ello dedicates themselves to the creation of stylish water bottles to provide you with a great pick – me – up for every day. Chef’s Star never settles for anything that is less than the best. Their products are a unique combination of exceptional craftsmanship, eco-friendly composition, healthy materials and modern design sensibility. This is what makes these glass water bottles so very popular with reusable bottle users. Glass Type – These really are some of the prettiest earth friendly bottles ever. They are marketed as a way to store freshly squeezed juices which makes them seem even prettier when you imagine them on your brunch table, and not just in your car’s cup holder. They are stylish, cylindrical, leak proof and compact. Safe beverage storage that is really, really pretty. Of course they are BPA and phthalates free and won’t transfer flavors, stain or retain odors. Much better than those old fashioned juice jugs in grandma’s fridge. 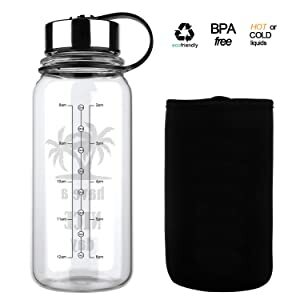 Features of the lid – Whether you are carrying fresh clean water or home squeezed juice the lid on the Chef’s Star Glass Water Bottles will keep everything spill free. The air tight and leak resistant caps have carrying loops, but they never leak, even held up side down. Sizes – This 6 pack of sleek and slim 18 ounce glass containers make a great travel companion as they will fit into standard cup holders. Each one easily fits into tight spots like a lunch bag or in the fridge. The set of 6 make a beautiful display at home, too. Glass Type – Brieftons Glass Water Bottles are made from high quality, thick soda lime glass. This glass is phthalates, BPA, cadmium and lead free. The glass will not leach any odors or toxins as it is chemical free. The ultra clear glass is non permeable, and has a low expansion rate which makes them great for storing warm or cold beverages. They are terrific for in the fridge but also are impact resistant so they are good to take with you on a picnic, to the office or to the gym. Features of the lid – Brieftons Glass Water Bottles each come with a 201 – grade stainless steel cap. The caps are leak proof and have a silicone O- ring that makes a water tight, air tight seal. Even hold the bottle up side down and you have no leaks. The air tight seal means that oxygen can not get to your beverage so if you are carrying juice the air can not break down any of the enzymes and ruin it. Sizes – This 6 pack of Brieftons Glass Bottles each have a capacity of 18 ounces. They measure 8.7 inches in height x 2.6 inches in diameter. The mouth opening is 1.2 inches for the inner diameter and 1.6 inches for the outer diameter. This is big enough to get most ice cubes into but still small enough to be comfortable drinking directly from the bottle. They store easily in the fridge, school bag, cupboard, most car cup holders, handbags, or gym bags. Other Features – The Brieftons Glass Bottles are easy to clean and are dishwasher safe. A unique aspect of these is their ability to be substituted for the glass bottles used for aquasana, pratico, camelback, evenflo, chefs, estillo or epica. The package includes the 6 reusable, clear, thick walled, Brieftons 18 ounce glass bottles, and a bottle cleaning brush large enough for easy and effective hand washing. It also includes two juicing recipe ebooks that are exclusive to Brieftons. They are the Quick Juice Recipes and Brieftons Guide to Juicing ebooks. The Brieftons Glass Water Bottles are covered by a full unconditional money back guarantee. This applies if you are not happy for any reason with the glass bottles. The glass part of the bottle is dishwasher safe but could be hand washed, if you prefer. The bottle brush provided is designed to clean the insides of the bottles. The O- rings and lids should be hand washed only. Never attempt to sterilize them in very hot water. Never subject the glass to extremely high or extremely low temperatures. Never put the bottles into the microwave nor into the freezer. Glass Type – This Reeho Glass Water Bottle is manufactured out of eco – friendly, BPA – free borosilicate glass. This type of glass is easy to clean and can safely be reused over the long term. The borosilicate glass is specifically heat resistant so this is a good water bottle to use if you are drinking warm beverages such a teas. The temperature range this bottle can tolerate is from minus 30 degrees Celsius right up to 240 degrees Celsius. This is minus 22 degrees to 464 degrees Fahrenheit. Chances are your beverages are not going to maximize the temperature range. Of course, the glass is all 100% recyclable, cadmium, lead, PVC, Phthalate and BPA free. There are no harmful chemicals of any kind. This really feels like a high quality glass bottle. The feel of the glass is strong and thick, but it is lightweight enough still to be able to easily carry it. Wide Mouth –The diameter of the bottle’s mouth is 2.24 inches. Well wide enough for ice cubes or fruit to fit in nicely. Features of the lid – The unique and beautifully designed cap is made out of bamboo. It is easy to twist on and off and is absolutely 100% leak – proof. The bamboo cap fits nice and snugly and does not leak, always a good thing with a water bottle. Sizes – This Reeho Glass Water Bottle holds 24 ounces. The portable size is of about 8.74 inches high including the cap and 3.15 inches in diameter. It is a bit wider than others and may not fit in some car cup holders. Other Features – The portable neoprene sleeve protects the bottle against breakage, makes it easier to carry, and is downright cute. The portable sleeve makes a firm and safe grip along with protecting the bottle. The neoprene sleeve includes a strap that makes it even easier to hold onto. It is great to put on the handle of your bike, or stroller, or other to hang any other place so that you do not even need to hang onto it. Even without holding onto it, it is still accessible, hanging out nearby. You can use these glass bottles with hot or cold liquids. The sleeve insulates to keep those liquids the temperature they shold be. The neoprene sleeve (in gray) may stain. Don’t spill any coffee on it to test that out. Before they designed the new Three Drops of Life water bottle from Borosilicate glass, the team at Three Drops of Life researched by listening to their followers and their royalty club members. Those recommendations and comments were important during the design process. Now, after several prototypes they are excited to present their newest product. This is the new Borosilicate glass bottle designed to specifically be more help for people striving to reach their daily hydration goal. Glass Type – The new Three Drops of Life water bottle manufactured from Borosilicate glass uses the Time Marker Hydration Tracking system. With time markers printed on the glass you can see exactly what amount of water you should have consumed by what point in the day. BPA and lead free you can leave the bottles behind. Highly eco – friendly, this high density non toxic Borosilicate glass won’t contaminate our environment. The glass bottles keep your filtered water fresh and clear and give you the option to carry beverages of any temperature. The glass itself is easy to clean and will maintain its clarity in the long term. The bottle is dishwasher safe. The glass is, of course, absolutely 100% recyclable. This is really a sleek and sophisticated durable and unique water bottle. Features of the lid – The lid is made from brushed stainless steel. Easy to carry and tested to be perfectly spill and leak proof. The glass bottle is safe in the dishwasher but this stainless lid is best hand washed. The ring attached to the top is to make carrying it easier. Sizes – The new Three Drops of Life water bottle comes in a 32 ounce /1000 ml size. The idea is that two daily fill ups of water will equal over 64 ounces of true hydration. An easy way to measure and maintain daily hydration goals. Other Features –The most unique feature of the new Three Drops of Life water bottle is the special time markings for hydration monitoring so you can meet the necessary daily goals. There is included in the box a free add – on silicone ring. This ring fits over the bottle itself acting like a bumper. It makes the bottle easier to grip, carry and helps resist impacts. The silicone ring is removable, as it can obscure your view of your hydration tracking. Your new Three Drops of Life glass water bottle is packaged in a custom designed box. The bottle is tightly fitted for safe shipping so there is no chance of breakage. Glass water bottles are an exceptionally good choice when it comes to reusable bottles. The designs are sophisticated and there is such a wide variety of colors and styles that there is something for everyone. Glass is chemical free, unlike many plastics and metals. It will not leach poisons into your beverage. Glass can be used in a wide temperature range, so you can carry teas or ice cold water, in the same bottle. Glass will keep your clean water fresh and clean. Glass is particularly easy to clean, especially in a dishwasher. Glass will not fade or turn color. It keeps its clarity for the long term. Glass is environmentally friendly. It can be recycled over and over and over again. Plastic water bottles are an enormous threat to our planet. It has been estimated that over 100 million plastic bottles are disposed of, every single day, just in the United States alone. If we all drink our daily hydration requirement in clean, clear, non-toxic glass water bottles we can reduce the waste and help our planet. Exactly how much water each person needs to drink on each day is still up for discussion. Experts tell us that there are several factors to consider. The person’s height and weight. The person’s general activity level, and current activity level. The person’s emotional and psychological stressors and stress levels. The climate, especially the humidity. The person’s general diet, and foods recently eaten. Based on this analysis of the best glass water bottles, we have narrowed it down to two. We would choose the Three Drops of Life water bottle with the hydration measurements on the sides for every day, and for workout use. In addition, at least one absolutely styling Bkr glass water bottle would need to be available close by. This is sort of like having a regular purse for daily use and a special one for dress up events. Taking the Bkr to the board room just seems like a better idea. Whatever your choice, know that a glass water bottle is an excellent way to be sure you keep hydrated and be kind to the planet.